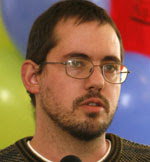 [Paul Aaron is a well-known poet and progressive activist in Hillsborough, North Carolina. He is also my brother-in-law. He, like me, believes that the work of resurrecting hope in this country only began with the Election of President Obama. It will require each one of we citizen activists, through networks like Blogger, to continue to articulate what we want an Obama Presidency actually to do. And almost more importantly, what sort of a ‘feel’ we want it to have, and to generate in our country, and around the world. This is Paul’s opening shot on the subject of taxes. I don’t necessarily agree with all that he says. Who paid for World War I? Who paid for World War II? Who paid for the Korean war? Who paid for the Viet Nam war? Who paid for the Iraq war? Then who is paying for this war? I’ve been thinking about the word “tax.” The word “tax” riles us. Yet, President James Madison believed that “taxes are what make a civilized society.” Similarly, the word “king” has a nice image but if we visualize the United States ruled by one, the word is suddenly not so attractive and romantic. Context always changes meaning. Perhaps “tax” is actually good. We are not taxed to fund a king’s dynasty; we are United States citizens and therefore, we the people are the government. By paying taxes, we provide crucial resources for ourselves. 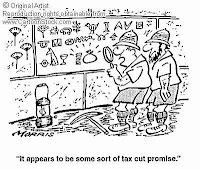 How can essential taxes be characterized so negatively? How did we get to this desperate economic place? We redistribute wealth by having tax breaks for the upper class—to the billionaire CEOs and corporations—to the hedge fund money managers and the oil magnates, and by increasing every day costs such as gasoline and food. Redistribution of wealth to the super wealthy is still redistribution of wealth. The rich get richer, the poor get poorer and the middle-class gets squeezed out. Joe the plumber and Jessica the restaurant owner will do just fine if we stop redistributing the wealth to the wealthy through corporate tax breaks. So who is paying for the gasoline our military trucks use? Who is paying for the security contractors of Blackwater. Who is paying for the Halliburton meals for our troops? “And I am,” smiled a European tourist on a shopping spree, buying up a piece of Manhattan. “In the last 18 months we tourists bought one-third of all new Manhattan condos that were for sale, while native New Yorkers remained worried about bonuses and the economic climate,” (paraphrase from Christine Haughney of the New York Times of December 21, 2007). Wow! So you all get rich because of our tax breaks. Is that right? OK, so you’re saying corporate tax breaks come from thinking that if the rich get richer, money trickles down all the way to the poor, and we all share the wealth. Democracy has spoken. And I congratulate Jacob on his victory in the Election for a Worker-Owner Director. I am truly delighted that we managed to increase the number of Worker-Owners who chose to vote this year, as compared with last year. I thank all of you who voted for me – and everyone who took part in the democratic process. It is that democratic process that sets us apart from conventional capitalist corporations. Every single vote cast is a statement. And I know that Jacob will ensure that the voice of every Worker-Owner – and every Worker – is heard on the Board. I would like also to thank all those on the WSM Elections Task Force, the WSM Elections Oversight Committee, and everyone in the Marketing Department, all of whom worked so hard on this Election.